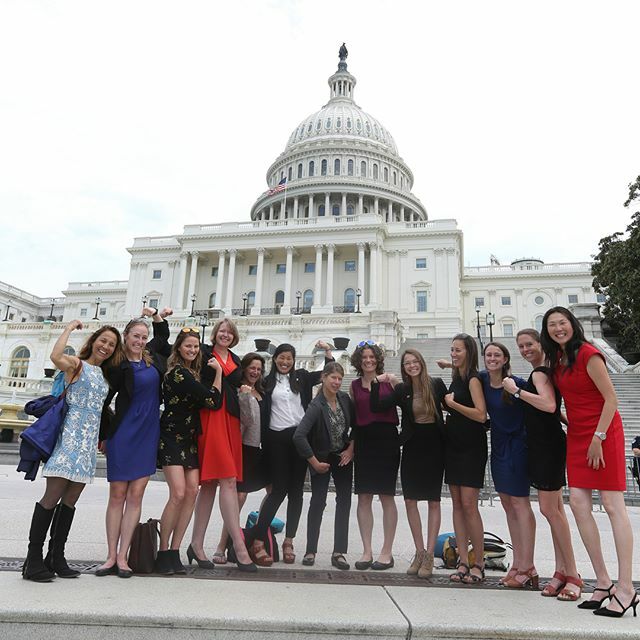 On May 9-11, some of the nation's most prominent climbers took off their down jackets and donned suits on Capitol Hill to advocate for public lands, outdoor recreation and environmental issues. 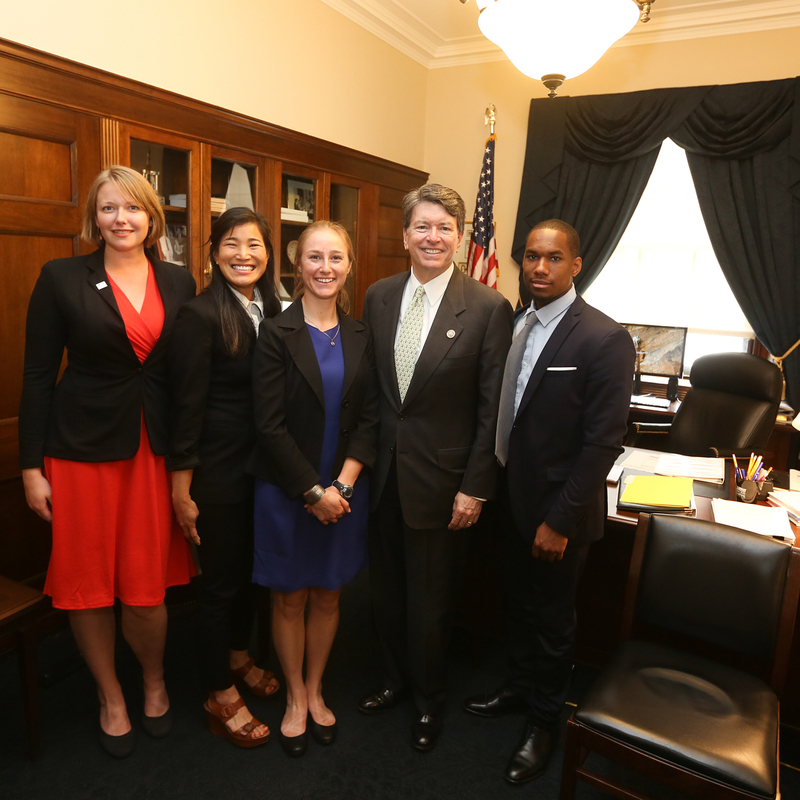 More than 60 climbers, advocates and representatives of the outdoor industry attended this year's Climb the Hill in Washington, DC. 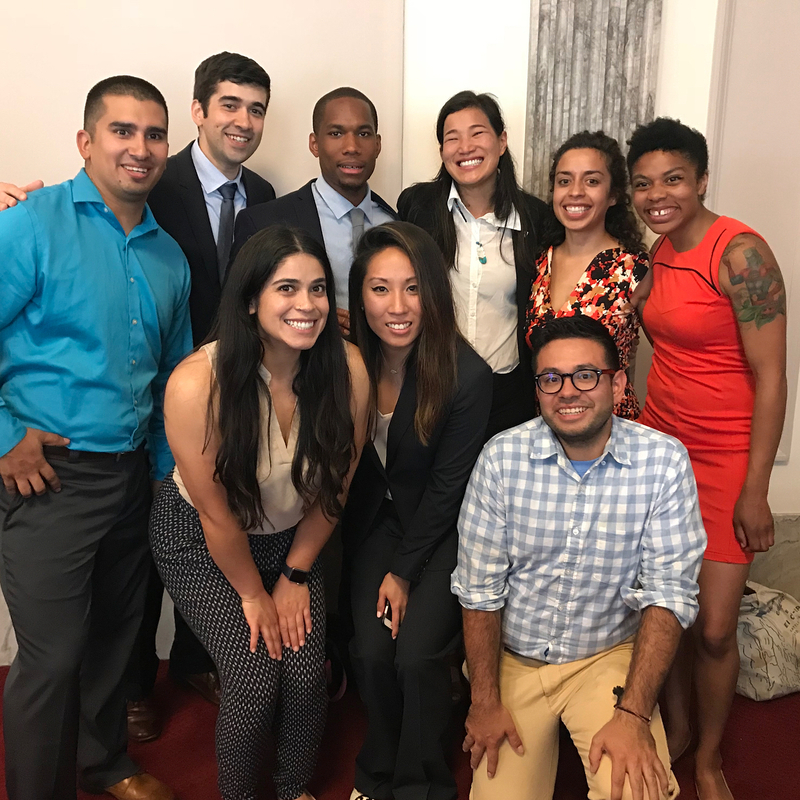 Organized by the Access Fund and American Alpine Club, 13 teams participated in 62 meetings with congressional representatives and federal lands administrators. It was the largest iteration in the event's three-year history. The group of climber representatives included Quinn Brett, Majka Burhardt, Tommy Caldwell, Sasha DiGiulian, Caroline Gleich, Margo Hayes, Lynn Hill, Alex Honnold, Bethany Lebewitz, Mikhail Martin, Maricela Rosales, Chelsea Rude, Libby Sauter, Forrest Shearer, Geoff Unger, Jessica Yang and Alina Zagaytova. Along with other Climb the Hill participants, they focused on pending legislation related to public lands and national monuments, permitting processes, energy development, and land and water conservation. "I'm really excited about the strength of the climbing community," said Maria Povec, policy and advocacy director for the American Alpine Club. Povec helped start the event three years ago. In the years since, she's seen growth both in participation in the outdoor recreation community and in recognition on Capitol Hill, as representatives and staffers greeted returning participants who were familiar to them from previous visits. This was also the first year that congressional offices started calling event organizers to set up meetings, instead of the other way around. Other organizations such as the Outdoor Industry Association and Protect Our Winters also lobby annually in Washington, but climbers have a unique position from which to advocate for policy that extends far beyond outdoor recreation, Povec said. "[Climbers] have a really profound connection with the land," Povec said. "It's part of why people love climbing. It captures their spirit of adventure; it takes them to new, wild places." Congressional delegates have reason to listen. According to a 2017 report, the outdoor industry generates $887 billion in consumer spending, and a Bureau of Economic Analysis report earlier this year estimates that outdoor recreation accounts for about 2 percent of US gross domestic product. Erik Murdock, policy director at the Access Fund, said he saw a huge increase in the number of congressional staffers—even representatives—who identified as climbers. It's a trend that mirrors the country as a whole, he said. Climbing is growing, and fast. While aggressive rollbacks of public land protections have taken place since January 2017, Murdock said two federal developments might offer some hope ahead, in a few aspects of land management. The omnibus bill passed in March designates a massive increase in federal funding toward wildfire suppression starting in 2020. In recent years, fire suppression has eaten away more of the Forest Service's budget than ever before. In 2015, it cost the agency 52 percent of its budget—up from 16 percent in 1995, according to a 2015 report, and the figure has only gone up in recent years. Murdock said this cost forced the Forest Service to make trade-offs with other high-priority initiatives, including recreation and conservation. The Access Fund has been lobbying for a similar increase in funding since 2015. In April, Secretary of the Interior Ryan Zinke issued a secretarial order that demanded federal agencies explore detailed and comprehensive plans to expand outdoor recreation opportunities. Last week, Climb the Hill delegates met with high-level representatives of the National Park Service to discuss how this might improve climbing areas. These are just glimmers of possibilities, however, amid an overall federal context that includes major threats to conservation, the environment and public lands. The Trump administration has eliminated climate change-related initiatives from federal agencies, expanded oil and gas drilling, and cut rules that protect endangered and threatened species, in addition to pursuing other controversial policies with heavy environmental impacts. Even the omnibus bill contains provisions of concern to conservation communities. For example, the bill makes it easier for logging projects fewer than 3,000 acres in size to move forward, and it could delay habitat protections for newly listed endangered and threatened species. "The fight ahead is going to be very long," Murdock said. "But we do believe the pendulum will swing back in our favor." In the week since the event, Rep. John Curtis (R-UT) agreed to climb with advocates at Joe's Valley, a world-famous bouldering area, to better understand issues associated with the activity. Povec said she was excited that Sen. Angus King (I-ME) agreed to co-sponsor the Recreation Not Red-Tape Act after the event. The latter is a bipartisan bill intended to, among other initiatives related to outdoor recreation and the stewardship of public lands, make the permitting process for guides faster and easier to navigate, according to the text of the bill. Murdock said the current permitting system moves slowly, and is difficult for aspiring guides to navigate. The event featured participation from representatives of a wide range of organizations including Brown Girls Climb, Brothers of Climbing, Latino Outdoors, the Carolina Climbers' Coalition, Mazamas, Mountaineers, Outdoor Alliance, Red River Gorge Climbers' Coalition, Salt Lake Climbers' Alliance and Wilderness Society. Bethany Lebewitz, founder of Brown Girls Climb, said it's important to elevate the voices of people of color and marginalized communities in land management decisions. She said the Recreation Not Red-Tape Act could help boost the presence of underrepresented communities in guiding and outdoor leadership roles by streamlining permitting processes. More advocacy work, however, remains to be done to uphold the monuments designated under the Antiquities Act—and thus to help preserve the history and culture of local and Indigenous people for whom land holds deep meaning beyond recreation and climbing. The Trump administration has already dramatically cut the size of Bears Ears and Grand Staircase-Escalante National Monuments in Utah, which hold cultural significance to Indigenous communities in the Southwest. "It's really critical, if we want to manage our land in an ethical manner that we really have to engage with everyone that these lands and these policies affect," Lebewitz said. Lebewitz said it was heartening to see some degree of inclusivity during Climb the Hill. However, there's a long way to go for all groups to be represented in climbing, the outdoor industry and environmental advocacy. "We all need to stand up, speak out, and call our reps," she explained in a press release. "Native history, black lives, and the brown experience are all critical voices for an ethical and inclusive approach to land management and environmental policies." Both Povec and Murdock said they anticipate the event will grow in participation, visibility, efficacy and impact in future years. "People are going to remember that the climbers were in town," Murdock said. For more background of the event, see our Climb the Hill preview.